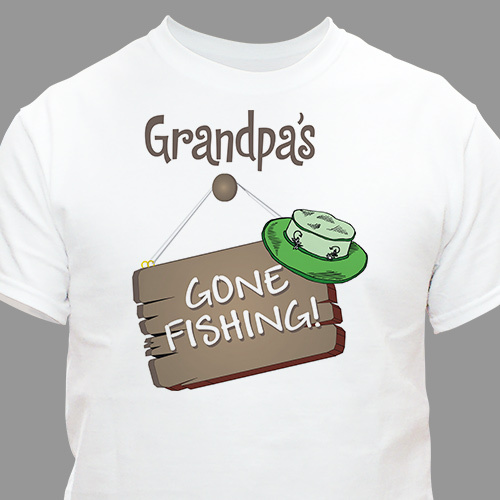 Create a fun, novelty Personalized Gone Fishing T-shirt for your Dad, Grandpa or Brother to enjoy all year round. They will look great and don't be surprised if they sneak off and get some fishing in while wearing one of these personalized Grandpa Shirts. Our Personalized Gone Fishing T-Shirt is available on our premium white 100% cotton Personalized T-Shirt, machine washable in adult sizes S-3XL. Includes FREE Personalization! Personalize your Gone Fishing T-Shirt with any title.